Here's a secret from the set of the Charmed reboot. The Book of Shadows? That detailed tome of divinations? It's very heavy. "I was getting a sweat on," says Madeleine Mantock, who plays Macy, the eldest of the three witch sisters, of the time she had to run up and down stairs with it. The new Charmed premieres October 14 on The CW. It takes the premise of the 1998 series -- sisters with supernatural powers -- and filters it through a distinctly 2018 lens. This version takes place on a college campus where a professor has been accused of sexual harassment. Sister Mel (Melonie Diaz) is a graduate student in the women's studies department, while Maggie (Sarah Jeffery) is rushing a sorority. After their mother is mysteriously killed, the third member of their trio shows up. She's Macy, a scientist and their long lost sibling. 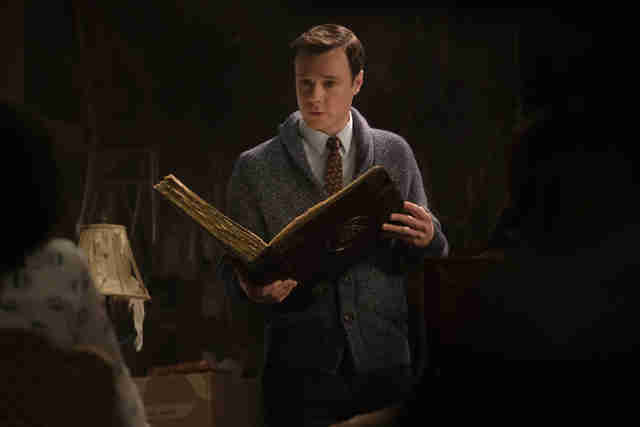 Also whooshing in is Harry (Rupert Evans), a suspiciously charming British man who informs them of their magical capabilities. 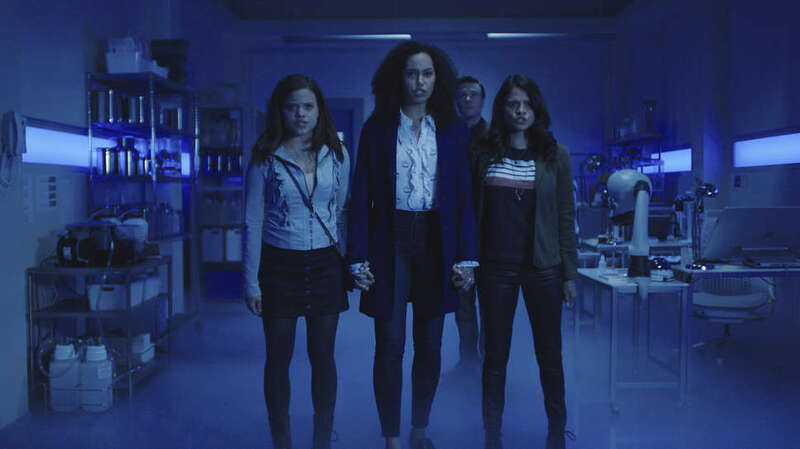 Nouveau-Charmed is intersectional -- the leads are of Latinx descent and Mel is queer -- and clued in to the zeitgeist, but there are still spells and demons and all that good stuff. News of the reboot didn't sit particularly well with original cast members, specifically Holly Marie Combs. At the Television Critics' Association summer press tour back in August, cast and crew assuaged concerns. "That show wrapped up everything so wonderfully. We saw their happy endings, and we saw even glimpses into their future. And I don't know. That's part of it. You feel like it told a complete story," creator Jennie Snyder Urman said. "And we didn't want to mess with that mythology, obviously, because it was eight years. Of course, we can empathize. It's a huge part of her life." After their talk, Thrillist gathered in the hotel lobby of the Beverly Hilton with the executive producers and stars of the show to get some more details on the series. CBS had approached Urman (the woman behind Jane the Virgin) about taking on a remake, and she enlisted Jane writers Amy Rardin and Jessica O'Toole, who were fans of the original. "We draw on our personal relationship a lot just to get to tell a story of strong women, the wish fulfillment of magical powers," Rardin says. While Urman, Rardin, and O'Toole wanted to reshape Charmed, they knew it gave them a significant canvas to riff on. "They had a great mythology," Urman says. "It was eight years. When you're creating a show, there are so many things that you are thinking about, and if you are lucky enough to walk in and work with an IP that has such a passionate fanbase and well-structured mythology, that's a gift." Not that the reboot arrived free of fear or hesitation. It wasn't what Diaz, known for her work in indie film like Fruitvale Station, was necessarily looking for when she was tapped to play Mel. "I was a little nervous, and then I met with Jennie and Brad [Silberling] and Amy and Jessica, and their concept for the show was so cool, and the way they were going to modernize it. I was like, 'OK these are the people that I know will take the show to the next level.' And I know what Jennie did with Jane the Virgin, and that was game-changing for me in terms of television." Conversely, Mantock didn't have any anxiety until getting wind of some of the negative response from fans (and, ahem, a star) of the original. "Until people started airing their opinions -- which they are very entitled to do," she notes, "I just thought what a wonderful script we have, what an amazing cast." Urman knew from from the beginning that she didn't want the show to look the same as the first version when it came to casting. "We weren't looking to do a show about three white sisters who were witches," Rardin says. "That was a show that had kind of already been done." And while these sisters do share alliterative names like the sisters of the '90s, their personas aren't exactly analogous to their P-named predecessors. "I feel that there are some [similarities] in that we share powers," Mantock says. "They seem kind of inconsequential. When you look at the relationship that we share together it's just so different." The producers are planning to explore specific traditions related to these sisters' heritages. "I'm really curious about the whole Brujería, Santeria aspect of it," Diaz says. "My dad's family had weird Santeria statues. I feel like I'm really well versed in all that kind of stuff. The Santeria stuff is so ancient and it's really ingrained in Puerto Rican culture." That said, the producers didn't want to make it totally unfamiliar to fans of the original. Despite playing with different concepts for the Book of Shadows -- including one that resembled a Rubik's cube -- they settled on a traditional-looking book. "There's so much that's different, so you want to have the touchstones be recognizable," Urman says. The pilot opens with a voice-over saying, "This is not a witch hunt," a line that's quickly repeated by the Charmed Ones' mom, Marisol (Valerie Cruz). It's a pointed piece of dialogue. The idea was to "claim that language," according to O'Toole. "Powerful women have historically been called witches," she says. "What if they really were? And kind of thinking of that is something that is not scary, being a witch, something that you kind of celebrate." There's also the relevant contemporary context, with powerful men Donald Trump and Woody Allen using the term to discuss male persecution. So does the villainous Professor Thaine in the universe of the show. The writers were working on the pilot after Trump's election and around the same time the #MeToo movement was becoming a part of the cultural mainstream. Original Charmed cast members Rose McGowan and Alyssa Milano have been vocal in speaking out against sexual abuse in Hollywood. "When I first had my meeting with them we talked a lot about the 2016 election and how I am still seething at the mouth, so angry," Diaz says. "I don't think I'll ever move on from it. These women are angry and they are upset. And it's OK to be upset, and it's OK to be angry, and it's OK to do something with that anger." These themes show up throughout the series: In the premiere Harry, the women's Whitelighter -- an adviser of sorts -- tells them that the coming apocalypse has something to do with the current president of the US. Meanwhile, the mystery of Professor Thaine -- accused of harassment -- and his connection to Marisol will be explored throughout the season. What's the deal with Harry? Whitelighters are a holdover from the first generation of Charmed. Here, the relationship with Harry is messy. Mel is suspicious of Harry from the get-go. After all, he's a white, cis male running the women's studies department and replacing her mom. "They are in conflict with him throughout," Urman says. "He has rules of the way things are done, and those rules, metaphorically, are the patriarchy... You have this traditional white patriarchal guy, and then these three women who are saying we can figure this out, we can find different ways to do things, we are going to not be playing by your rules." And how are mimes involved? In the pilot, Mel uses her powers to freeze all the patrons at a coffee shop. That required a whole troupe of mimes. So let this put to rest the question that's been on every Charmed fan's lips: Will there be mimes?